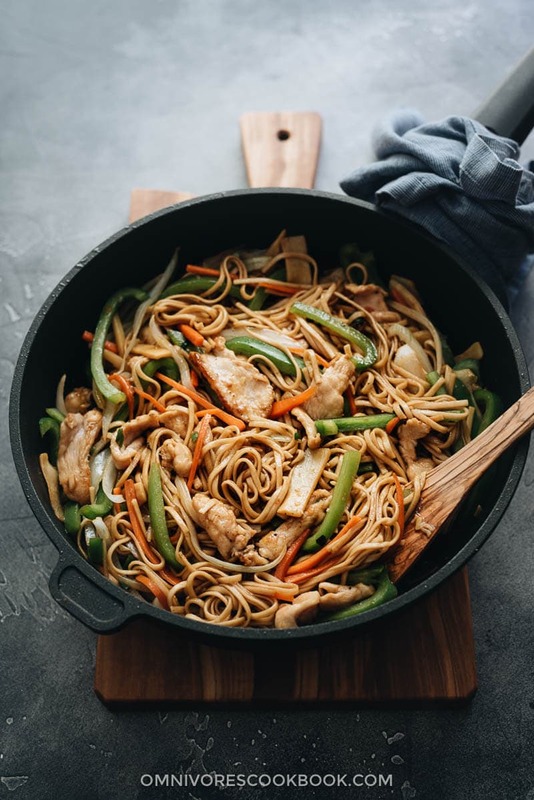 Chicken lo mein is one of those comfort foods like pizza and burgers, that you might crave on many occasions. 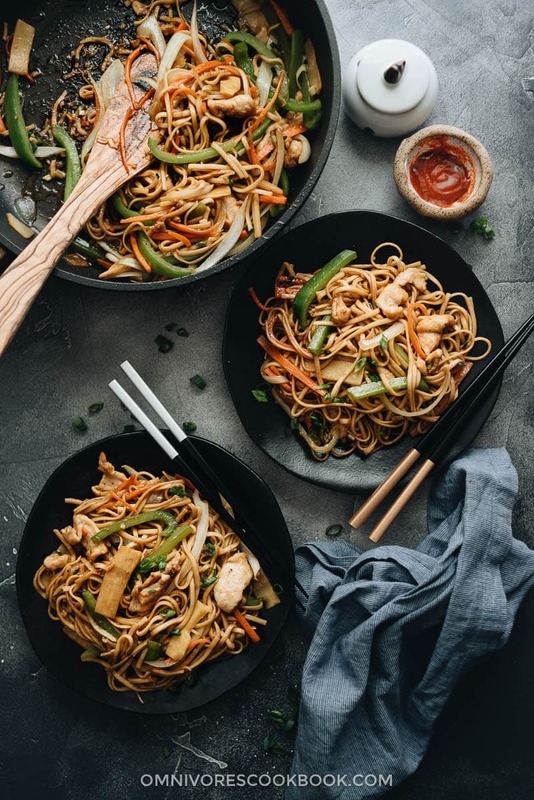 No matter whether it’s a busy Monday night, when you’re back home after a trip, or feeling cozy and want to stay in and watch TV shows, you might want to reach for that small box of Chinese takeout that is loaded with flavorful noodles and tender chicken. I’m not surprised that many people associate chicken lo mein with Chinese takeout. It’s definitely one of the iconic dishes of Chinese cooking. 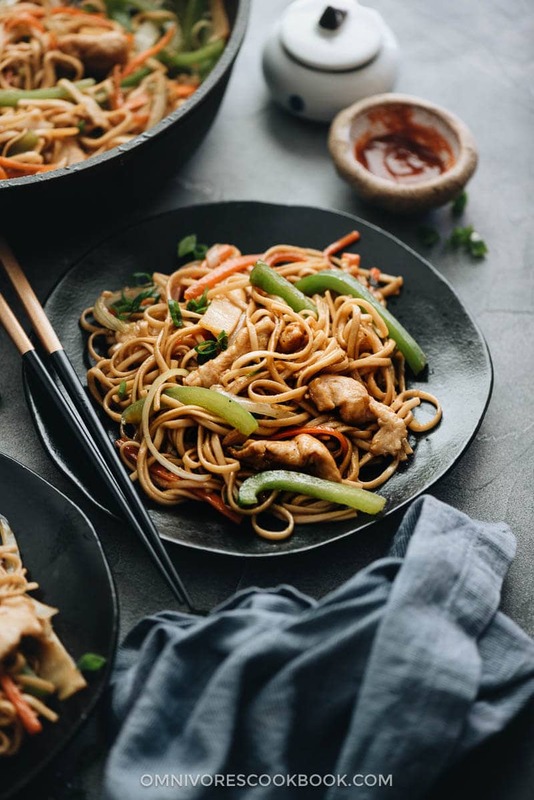 Here is the fun part – how you can make chicken lo mein at home, one that is not only practical and easy enough for home cooks, but also helps them make it as tasty as the restaurant version. Let’s jump into the details! The type that says “Chow Mein Stir Fry Noodles” (like this one on Amazon) or “Lo Mein Noodles” are the best ones to use. These noodles have a round shape, are quite fat, and yellow in color. They will create a dish that has the same look as the restaurant-version chicken chow mein. You can find them in Asian grocery stores and in many large grocery stores such as Walmart and HEB. Alternatively, I’ve found that udon noodles and wheat noodles work just as well in this dish. These noodles have a fat, flat shape and are usually in white color. The noodles will expand after boiling and have a nice texture once stir fried. Note: please don’t use the short crispy noodle sticks also labeled as “chow mein” noodles. They are fried noodle sticks that are mainly used in Chinese chicken salad and are not for cooking stir fried noodles. Always always marinate your chicken before cooking. It only takes a minute to prepare and 10 minutes to marinate. But it makes a big difference. Your chicken will end up juicy, tender, and bursting with flavor. The cornstarch not only tenderizes the chicken, but it also protects it from overcooking in the hot pan. It’s an important practice in Chinese cooking that I never skip. 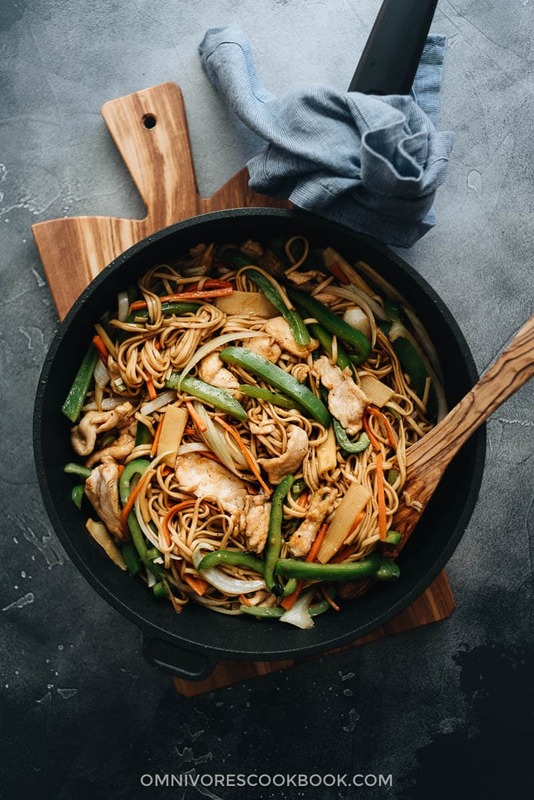 I love adding tons of vegetables to my chicken lo mein, which gives the dish a delightful texture and it makes your meal more balanced. My favorite items include bamboo shoots, carrots, onions, and peppers. You can also use mushrooms, bean sprouts, baby bok choy, spinach, water chestnuts, napa cabbage, cabbage, and zucchini. Note, the cooking time of the different veggies varies. As a rule of thumb, hard vegetables such as carrots, water chestnuts and carrots take longer to cook (3 to 4 minutes). Green leaves, such as spinach, take the shortest time to cook, as little as 1 minute. My favorite practice is to cook the veggies individually until almost done, then add them back into the pan later on. This way, your veggies will always cook perfectly and maintain their vibrant colors. Originally, chicken lo mein is not a gluten-free dish, because the right type of noodle is made of wheat. If you need to convert this dish to gluten free, you should replace the noodles with rice noodles. This will slightly change the texture of the dish but the results will still be super tasty. For detailed notes, please see the headnote inside the recipe card. The biggest mistake when making lo mein is to crowd the pan with too many ingredients. When you do this, the pan will take a long time to heat up, so all your food will be steamed instead of seared. The dish will end up watery and plain, generally lacking in flavor. I found that even a large frying pan can only handle 1 chicken breast, 6 oz. of dried noodles and up to 4 cups of chopped veggies. I expanded on this topic in my post Wok vs. Stir Fry Pan and you can find more information there. 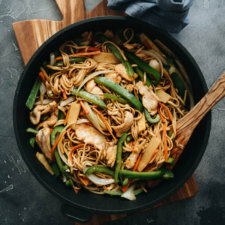 But, long story short, you can make a delicious chicken lo mein as long as you use a lot of aromatics (fresh ginger and garlic), a great lo mein sauce, and a pan that’s hot enough. You can achieve all of these by following my recipe below with a large nonstick skillet. In fact, if you have an electric stove at home (like I do), a skillet will heat up faster than a wok because it has a larger contact area with your stove. I toss my noodles using a pair of tongs and have never come across any problems. OK, this might be a lot of information to take in. But trust me, if you simply follow my recipe and try this dish once, you’ll be impressed at the results – the flavorful noodles, tender chicken, crisp veggies, and rich sauce that is bursting with flavor. I won’t be surprised if you think this version tastes even better than the restaurant version! Tender chicken, crisp peppers and bamboo shoots, and fat noodles all tossed in a rich sauce that is fragrant, savory and slightly sweet. 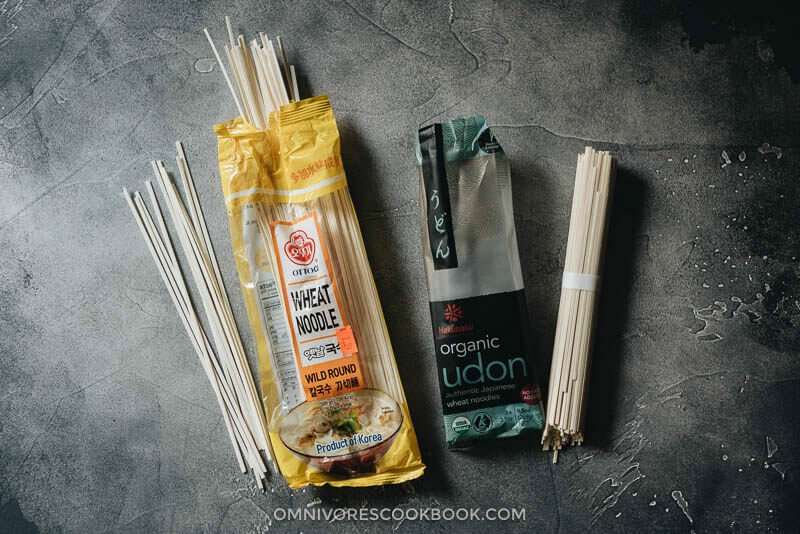 Make your favorite Chinese takeout without a wok and it will taste as great as the restaurant version!To make the dish gluten-free, use rice noodles instead of wheat noodles. Soak the noodles according to the package instructions, until al dente, then use them in the stir fry. Also, replace the Shaoxing wine with dry sherry, use tamari instead of soy sauce, and use homemade mushroom sauce instead of oyster sauce. Boil noodles according to package instructions until al dente. Rinse with tap water, drain, and set aside. I always cook the noodles 1 minute less than the package recommends. They’ll be a bit underdone, but will be perfectly cooked once stir fried in the sauce. Combine all the “Marinade” ingredients in a medium-sized bowl. Mix well and let marinate for 10 minutes. Whisk all the sauce ingredients together in a bowl. Chop aromatics and vegetables. Heat 1 tablespoon oil in a large nonstick skillet over medium-high heat until hot. Spread the chicken in the pan. Cook for 30 to 45 seconds without touching, until the bottom turns slightly golden. Flip to cook the other side for 30 to 45 seconds, stirring occasionally, until the chicken turns white but the inside is slightly pink. Transfer the chicken to a plate. Add 1/2 tablespoon of oil. Add onion, carrot, bamboo, peppers, and bamboo shoots. Cook and stir until the veggies just start to turn soft, 1 minute or so. Transfer all the veggies to a plate. Add the remaining 1 and 1/2 tablespoons oil and the ginger, garlic and green onion. Stir a few times to release the fragrance. Add the noodles. Toss a few times with a pair of tongs. Add the cooked chicken and vegetables back into the pan. Pour the sauce over the ingredients. Toss to mix everything together well. The noodles are done when the sauce is absorbed, 1 minute or so. Transfer everything to serving plates and serve hot as main. This was superb. I have tried to make lo mein before but never understood why it was bland. Marinating the chicken and cooking the vegetables separately was a game changer. The sauce was very flavorful, this will be my go to recipe for chicken lo mein. I love lo mein and really wanted to be successful at creating this dish. I was so afraid of messing it up! This is an excellent recipe with wonderful tips. I followed the recipe, only adjusting the veggies a bit according to what I had on hand. When I tell you that I enjoyed my dish more than my nearby restaurant, I say it with astonishment and pride.! Thank you so very much! I made fried rice which was equally as good! I will forward a picture if I can upload it! Maggie, this was delicious! I have been trying to find the recipe closest to restaurant style for a few months now and have tried many different variants. This hit the nail on the head! Perfect amount of sauce and following your instructions led to well cooked veggies that were just soft enough but still crisp like I like them. 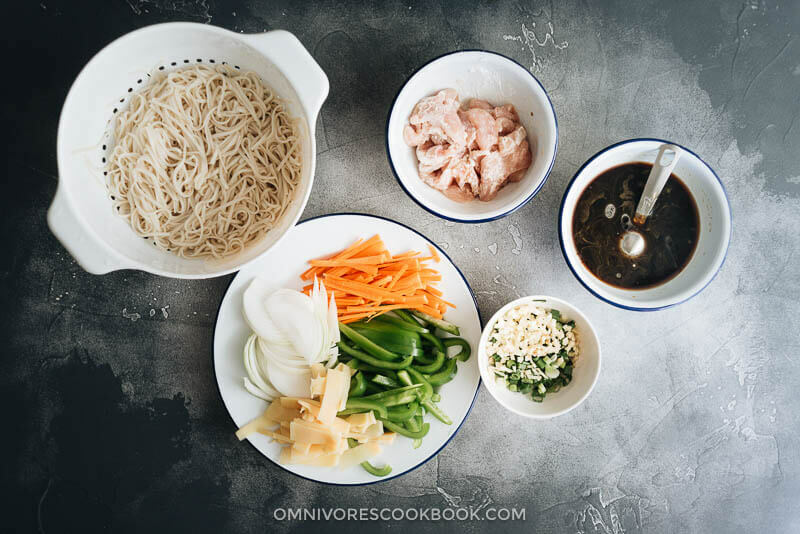 I will be using this as my base for lo mein from here on, thank you for sharing! Best Chinese food I have had in 30+ years. Felt like the wIzard of Oz cooking but it came out sooo very flavorful.. got a “10” from my husband and I give this 20 stars. Best I ever had. Maggie, I love your recipe. Thank you..our Chinese restaurant here is not good at all. I make my own orange chicken and baked sweet and sour chicken..but I welcome your recipes with open arms and a hungry stomach. I originally came from Westport, CT, and left to live in NYC, NY, so I KNOW really good food and you made my life so much nicer. Am not that into southern cooking, at least not great food in this area. I wrote a long review but when I posted it it did not take. This was the best Chinese chicken lo mein I have ever had..in over 3p+ years!! 10 stars!! Thank you Maggie. I like to make Chinese foodo as restaurants here are not good. This is the Chinese food I grew up with. I will welcome any of your recipes. This was sooo flavorful..the sauce PERFECT. Thank you so very much. I signed up for newsletter/recipes. Husband gave it a “10”+!!! Worth the work. I made sauce 2 days ahead and it was perfect. Like all the recipes from this blog I had tried bfore , It was so good.